The X-ray Astronomy Recovery Mission, or XARM, could launch as soon as March 2021, filling a potential gap in astronomers’ X-ray vision of the universe, according to the Japan Aerospace Exploration Agency, or JAXA. NASA has agreed to a junior partner in XARM — pronounced “charm” — and supply X-ray telescopes and a spectrometer instrument for the Japanese-led mission, according to Paul Hertz, directory of NASA’s astrophysics division. 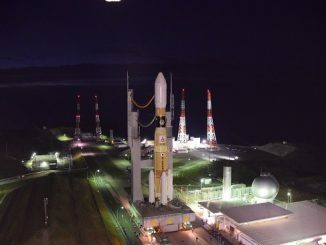 The Japanese Diet approved spending on XARM for the Japanese government’s current fiscal year, which started in April, and officials are in the final stages of formally kicking off development of the mission, Hertz said in a recent interview with Spaceflight Now. 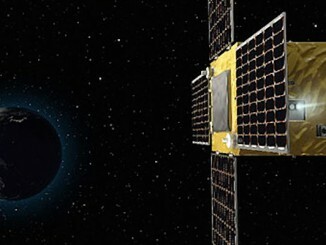 The Hitomi satellite failed in March 2016 after a series of attitude control problems caused the orbiting observatory to spin up and shed segments of its power-generating solar panels. Ground controllers lost contact with the satellite as it orbited more than 350 miles (575 kilometers) above Earth. Astronomers viewed the roughly $400 million mission as a stepping stone between current flagship-class X-ray telescopes, like NASA’s Chandra X-ray Observatory and the European Space Agency’s XMM-Newton, and an upgraded, more sensitive X-ray observatory called Athena due for launch in the late 2020s. Hertz said XARM will not have the observing range of Hitomi, which carried four scientific instruments sensitive to a range of X-ray wavelengths and gamma-rays, exposing astronomers to the workings of some of the most extreme events and environments in the cosmos, such as black holes, neutron stars and the creation of galaxies in the distant, ancient universe. XARM will instead carry replacements for Hitomi’s two lower-energy instruments — the Soft X-ray Imager and the Soft X-ray Spectrometer. Both instruments contain critical parts provided by NASA, and the spectrometer is primarily a U.S.-developed payload. XARM will not need an extendable 20-foot (6-meter) boom like Hitomi, Hertz said, because it will fly without the hard X-ray instruments that needed the deployable arm. Hard X-rays are at the higher-energy, shorter-wavelength end of the spectrum of X-ray light. 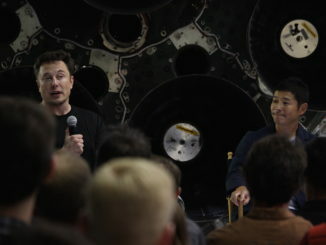 “That makes it a simpler mission, so although our part will be built-to-print, there will obviously be some changes on the bus,” Hertz said. The Soft X-ray Imager on XARM will also have improved resolution over the instrument on Hitomi, JAXA officials said. JAXA managers said NASA’s NuSTAR telescope, which sees the universe in hard X-rays, could fill in for the missing high-energy instruments on XARM. The two observatories could conduct coordinated, tandem observations to help realize Hitomi’s original science objectives. NASA will spend between $70 million and $90 million on its part of the XARM observatory, according to Hertz. Flight spares at NASA’s Goddard Space Flight Center from the original Hitomi development will help save some money, he said. The European Space Agency is also a minor partner in Hitomi’s replacement mission. A Japanese government document dated May 30 indicated JAXA would set up a project team and select a manufacturer for the XARM spacecraft within one year.